Elissa has been studying percussion instruments since age nine. Originally trained in western symphonic percussion such as snare drum, tympani, and auxiliary percussion, she soon branched out into marching drum and later into ethnic hand drums. Her focus in recent years has been Middle Eastern percussion, particularly Arabic tabla (also called doumbek or darbuka). 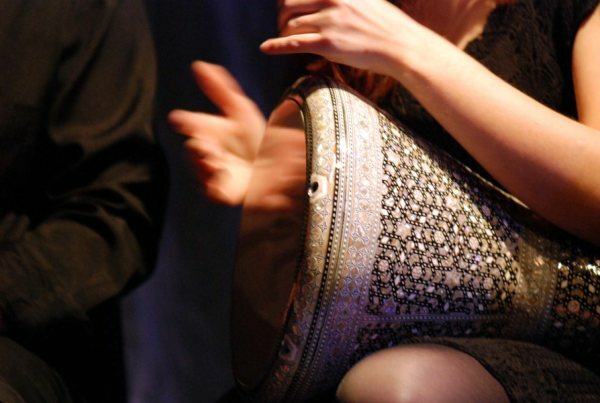 She is trained by master percussionist Souhail Kaspar and certified to teach his conservatory style. Prior ensemble work includes five years on the Pride of Arizona drumline at the University of Arizona in Tucson, various concert bands and orchestras, and drumline teaching experience in Tucson and Phoenix. She currently teaches Arabic percussion at the Plaza de Anaya in Tempe and performs regularly in Arizona and southern California. You are talented indeed. Go now, and fight for the Rebel cause! May the force be with you.